For the main course, I had in mind a rustic soup prepared by sautéing chopped fennel, onion, and carrots and then simmering those vegetables along with white beans in stock. Short on time, I opted for canned beans, rinsing and draining them well before stirring them into the pot, and was delighted with the results. For extra flavor some chopped fresh rosemary and dry white wine balanced the flavors nicely, while crispy julienned prosciutto and golden homemade croutons made fine garnishes. A salad of mixed greens, thinly sliced red onion, and toasted walnuts in a red wine dressing and a plate of cheeses rounded out the menu. Our friend arrived with a box of pastries—profiteroles with various fillings and a luscious chestnut and whipped cream creation known as a Mont Blanc. We had a leisurely meal, and then talked well into the night about this historic week in France’s capital. Our soup supper and good conversation were definitely restorative. 1. Trim the lacy stalks from the fennel and discard. Halve the bulb or bulbs lengthwise; cut out and discard tough cores. Chop the fennel to yield about 1 1/2 cups. 2. Heat the oil in a large heavy saucepan set over medium heat. When hot, add the fennel, onion, carrot, and garlic, and sauté, stirring often, until they are just softened and translucent, 5 to 6 minutes. Stir in the crushed fennel seeds, 1/2 teaspoon salt, and several grinds of pepper. 3. Add the beans and stock. Bring the mixture to a simmer, and then lower heat. Cook at a gentle simmer until vegetables are tender, about 20 minutes. Note: Crush fennel seeds in an electric spice grinder, or place them in a mortar and crush finely with a pestle, or put in a plastic bag and pound with a meat pounder or rolling pin. The seeds should be finely crushed. 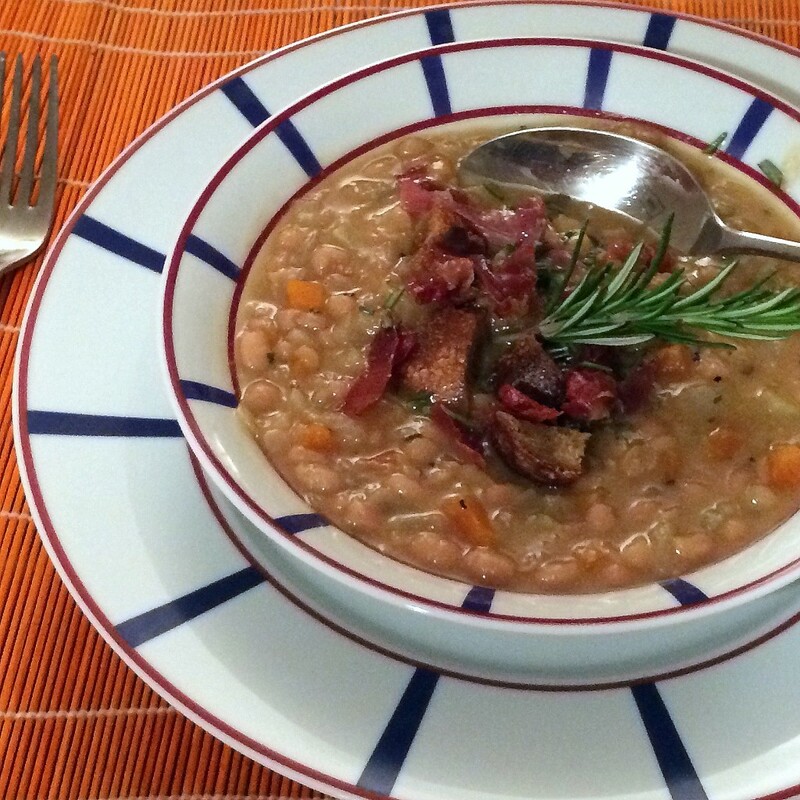 This entry was posted in Food News and tagged beans, fennel, Paris, prosciutto, soup, winter by brosbottom. Bookmark the permalink. Betty sounds delicious but as an fyi, when I clicked the print button what came up to print was not the recipe but a few lines with your url and copyright info. i just corrected it. I’ve just started using a new format so that the recipes can be printed for readers more easily and accidentally put the recipe in the wrong box! Thanks so much for letting me know. It should work fine now! Could you please add how many this recipe serves? I”m guessing 3-4, based on the 4 c. chicken stock? See step number “6.” which says it serves four more generously and six with smaller servings. The soup was delicious. Loved the fennel and am using it in other soups in addition to the celery, carrots and onions. Thanks so much. I’m a big fan of fennel and use it in many recipes! I made this today, for house guests arriving Wednesday from the U.K….who will think they are in the Arctic! Perfect after a long plane ride, will make the finishing touches after work Wednesday. Serving with a simple salad, preceded by cheeses, salami, and grapes. And my daughter will provide a simple sweet for after. Love love love your cookbooks! And so happy to have found this site. Thank you for your lovely note. That soup with the beans and fennel is so good for cold nights. Don’t know if you are in the path of all the snow making its way from the South to New England (again!!!) but that dish is perfect to stave off the winter chill. 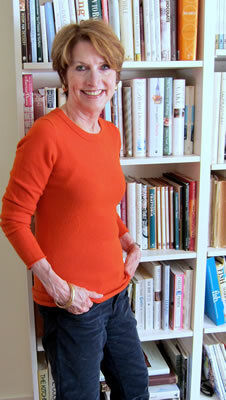 I’m so glad you are enjoying my books and hope the recipes on my blog will find their way to your table often!